Dr Michael Li is a fully qualified and experienced Chiropractor and TCM practitioner. Dr Li graduated from the University of Western Sydney with a B.Appsc (Traditional Chinese Medicine) and then went on to complete the Master of Chiropractic at Macquarie University. 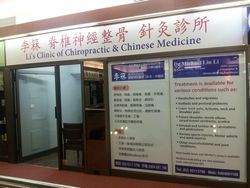 At Li's Clinic of Chiropractic & Chinese Medicine a wide range of treatment modalities is available such as Chiropractic adjustments and spinal manipulation, Chinese and remedial massage, Acupuncture, cupping and Spinal traction. Other musculoskeletal and joint conditions. Most health funds and Worker’s comp is available. Chiropractic treatment includes many aspects of manual therapy such as massage and its various techniques and different types of muscle stretching, rehabilitation including different exercises and tracks to restore musculoskeletal functions; and manipulation of the spine and other peripheral joints, which is our unique speciality. The manipulation techniques or adjustment that we use have many different methods, not all of which are HVLA or high velocity low amplitude thrust applied to a specific or misaligned spinal segment or peripheral joint by a chiropractor in order to restore proper joint motion. Chiropractic adjustments are delivered thru the hands with only minimal force and are associated with non or minor discomfort. The application of adjustments is often associated with a “cracking” sound that comes from gapping a synovial joint which releases the gases (oxygen, nitrogen or CO2) in the joint. Contrary to popular belief, chiropractors do not perform any “bone cracking” but rather gapping or mobilizing spinal and peripheral joints. The effects of Chiropractic adjustments has been researched in a few meta analysis studies such as Meeker & Haldemen 2002, which has found that Chiropractic adjustments can increase the mobility of restricted joints and have shown to have various other effects such as temporary relief of musculoskeletal pain, increased range of motion and increased muscle strength. Chiropractic care, in particular chiropractic adjustments have shown to be effective in treating lower back pain. In Walter et al 2011, a Cochrane Review of Combined Chiropractic Interventions for Low-Back Pain which consisted of 12 randomized control trials with a combined total of 2887 participants, concluded that chiropractic care can reduce pain and disability in the short and medium term for patients with lower back pain. In Rubenstein 2011,another Cochrane review which assessed the effectiveness of Spinal manipulation therapy for chronic lower back pain in 20113, concluded that in 26 different RCT’s and 6070 participants SMT was safe with no serious complications and is effective in reducing pain and improving function in patients with chronic lower back pain. Regarding the safety of Chiropractic adjustments, the World Health Organization in 2005 states that when "employed skilfully and appropriately, chiropractic care is safe and effective for the prevention and management of a number of health problems."